How to install Sublime Text in Ubuntu? 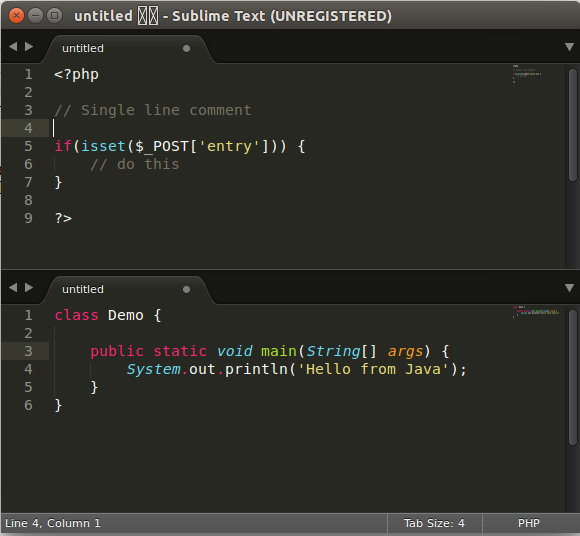 Sublime Text in loved most among PHP programmers. Sublime Text is a cross platform text and source code editor. Sublime text is not available from Software Center. It is not an IDE or Integrated Development Environment. But provides some features like code highlighting, auto code completion, multiple selections, split editing, distraction free mode, etc. How to install Sublime Text on Ubuntu? Go to Sublime text official website, and select to download Sublime Text 3 Beta release. From beta version page download 32 bit or 64 bit version. From here you will get a file with .deb extension. Don't download the one with .tar.bz2 extension. Now, double click on the file. It will get opened in software center, and will install. NOTE- If you'll download file with .tar.bz2 extension. You're required to extract the file and then double click the executable file again and again to run Sublime Text. Also, it won't get installed on your system, and you cannot search Sublime Text from Search bar. How to Bring back classic menu on Ubuntu? How to install Sublime Text theme on Netbeans? How to install NetBeans IDE 8.0 on Ubuntu? Android Auto: How Google can make it better? How to install JDK 8 on Ubuntu?